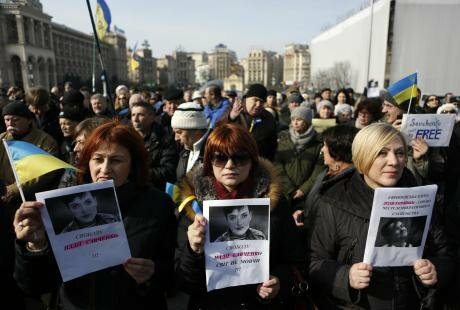 March 2016: 2,000 people rally in support of Ukrainian pilot Nadiya Savchenko at Independence Square in Kyiv. (c) Sergei Chuzavkov / AP / Press Association Images. All rights reserved.Early last month, Anton Gerashschenko, MP and adviser to Interior Minister Arsen Avakov, used his Facebook page to announce the publication of a list of email addresses and personal phone numbers belonging to 7,000 (initially 4,000) media workers. These journalists were said to have “collaborated with the terrorists” following the outbreak of war in eastern Ukraine in 2014. Their crime? Obtaining journalistic accreditation from rebel authorities in the Donbas. The website that hosted these leaks, Myrotvorets (“Peacemaker”), has long been an object of scrutiny by human rights activists in Ukraine. Since late 2014, the website, founded by former state officials and security service employees (SBU), has run an online database of personal data of people considered “enemies of Ukraine” — soldiers suspected of fighting on behalf of the separatists, participants in anti-Maidan rallies and public officials in the “People’s Republics”. Indeed, among Ukraine’s patriotic majority, the information collected by Myrotvorets volunteers is believed to be of great use to Ukraine’s security services, and the website enjoys tacit approval from the government. But this particular leak sparked a nationwide scandal, and the heated public discussion turned on two issues — whether it is appropriate to publish sensitive personal data, and whether reporting in eastern Ukraine using separatist accreditation counts as “collaboration”. More worryingly, these accusations of treason against journalists reveal a deep mistrust towards the Fourth Estate shared by many Ukrainians — an unfortunate consequence of the propaganda that surrounds the “hybrid war” in Donbas. As soon as the Myrotvorets scandal erupted, opinion makers and internet commentators were quick to dub the people on the list “traitors”, suggesting that they should be exposed by any means necessary. Nevertheless, the overwhelming majority of outraged patriots (and the Myrotvorets website itself) emphasise the public importance of information concerning who is collaborating with the enemy. According to this logic, every concerned Ukrainian should be able to access this information. If we follow that argument to the end — how sensitive might a person’s telephone number really be, apart from compromising their safety? Safety is, indeed, an issue in this case. Speaking about the leak at the recent Lviv Media Forum, US Ambassador Geoffrey Pyatt mentioned Simon Ostrovsky and Clarissa Ward, foreign correspondents kidnapped in Donbas during their assignments. OSCE and Reporters Without Borders have also issued statements expressing their concerns for journalists’ security. When asked about the aftermath of the Myrotvorets leak, Iryna Chulivska, an expert at Ukraine’s Institute for Mass Information, says that journalists’ safety is the biggest concern here. The accreditations in DPR were issued to journalists, fixers, video operators, translators, and photographers not only from Ukraine and Russia, but from other countries as well. Slovyansk, eastern Ukraine. CC UNICEF Ukraine / P. Zmey. Some rights reserved.As Ukraine is not the hottest topic in the foreign media anymore, journalists often come here in their own initiative and at their own risk. After having been accused of helping “the terrorists” in the “People’s Republics” of Donetsk and Luhansk (which have not yet been recognised as terrorist organisations by the Ukrainian parliament) and receiving dozens of angry emails from “patriots”, these people might have second thoughts about coming here. And Ukraine will lose on international coverage. For Ukrainian journalists, the situation will also get worse, reasons Chulivska. “It can be dangerous for them to work in territory controlled by Ukrainian army. After all, for a person not too versed in the peculiarities of journalism, this list is a direct call to action: these people are collaborating with the Donetsk People’s Republic, they should be punished.” Not to mention the anonymous threats some journalists have started receiving at home. Pyatt also addressed Arsen Avakov, Gerashchenko’s boss at Ukraine’s Interior Ministry, in the hope that the interior minister would condemn this leak. However, that seems unlikely. Commenting on Myrotvorets earlier, Avakov invented a new word to describe the accredited journalists and their supporters: “liberal separatists”, a term all too reminiscent of Vladimir Putin’s “national traitors”. For supporters of Myrotvorets, however, sending a journalist to the frontline is not an issue of security — it is an issue of morality. Vitaly Portnikov, a leading Ukrainian television journalist, argues that he could not imagine an Israeli journalist getting accreditation for Gaza, so a Ukrainian journalist doing so in the “People’s Republic of Donetsk” is a hypocrite. This kind of accreditation isn’t a safeguard for a journalist, Portnikov told Radio Liberty, it is treason. Butusov, Portnikov and other “patriotic journalists” are satisfied without any journalists entering contested territory — they claim that official messages from the state’s army and security, as well as rumours from people fleeing the war, are enough for them. Who needs unbiased journalism anyway? This isn’t the first time a heated discussion has emerged over journalists’ ethics and propaganda in Ukraine. Stanko, who was the first to raise the issue of the Myrotvorets leak, found herself at the wrong end of popular resentment at the end of 2015. After Stanko spoke about media cliches and hate speech at a journalism workshop at Lviv’s Ukrainian Catholic University in December, prominent Ukrainian writer Oksana Zabuzhko accused Stanko of downplaying the conflict, calling the Hromadske journalist a “terrorist accomplice” for revealing an instruction to describe separatist militants as “fighters” instead of “terrorists”. One such ridiculous stunt was the storming of Ukraine's Information Ministry (see the video above) by members of Right Sector and C14, two far-right groups, after a deputy minister initiated a lawsuit against Myrotvorets. Here, the hunter played the victim — the website claimed it was being harassed by the government and announced its shutdown. The closure turned out to be a false move: only a week later, Gerashchenko announced that the site would resume its activities as usual. Subsequently, Myrotvorets published even more leaks, becoming bolder in its rhetoric and openly referring to the Ukrainian journalists on its list as “local pro-Russian terrorist rabble”. One publication was an update of the original list, and another was the list of journalists accredited in Russia. The public significance of the latter publication, which was taken down shortly after, is unclear; however, it certainly played its role in polarising attitudes further. Apart from the incident at the Information Ministry, Ukraine’s “ultra-patriotic” far-right have shown little interest in the Myrotvorets leak — they seem to be preoccupied with the upcoming LGBT+ pride march in Kyiv, where they would very much like to repeat last year’s attack. Instead, the principal driving force behind this witch hunt against “accredited traitors” and the refusal to speak of enemy combatants and residents of the occupied territories in unbiased terms are the same people — Ukraine’s “patriotic majority”. 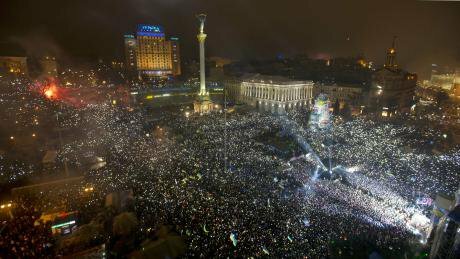 Maidan emerged as a protest against a government that many perceived as a direct descendant of communist rule. The communists (naturally) had little chance of finding a place in the Maidan’s ranks; anarchists and other non-communist far-left activists had been driven away along with them. January 2014: a pro-European Union crowd hold lights while singing the Ukrainian national anthem as they celebrate New Year. (c) Efrem Lukatsky / AP / Press Association Images. All rights reserved.Thus, with the “radical left” almost entirely missing, the Maidan and post-Maidan political spectrum lay between the “liberal left” and the “radical right”. Both these groups have since found their place in post-Maidan activism (with the radical right embracing populist rhetoric, and having developed to a far greater extent), but they are not the major players here. Caught between these two extremes, Maidan’s public could be divided into two loosely-defined categories. First, there were “professional patriots”, members of the Ukrainian intelligentsia working at various state cultural institutions, as well as the patriotic element of the artistic world. The second, and larger group were those who hadn’t been engaged in any political activity before Maidan and the Russian intervention (and for whom the Orange Revolution of 2004 was a distant memory). These people were the “newly-initiated” activists who provided the “mass” for the mass protest. It is hard to single out a typical “neophyte”, as they all come from different social backgrounds. Predominantly urban office workers and small business owners, these people have rediscovered and reshaped political and civil activism in Ukraine. Powerful movements of “volunteers” have emerged largely thanks to this constituency — people who donate money and buy equipment for army units, bypassing the often cumbersome logistics of the state. As almost all Maidan’s newcomers are dedicated to European integration and European values, those who have not identified as liberal left naturally drift towards moderate and centrist position. But as the Ukrainian public is heavily polarised between right-wing populism and liberalism, these people often find themselves in the more dominant far-right camp. Unable to voice a strong “middle ground” opinion, this constituency’s centrism is right-leaning, with an emphasis on patriotism, “the national idea”, national identities, traditional values and other issues generally associated with the right-wing agenda. When someone is new to activism, they start by searching for information. They need to learn how to voice their opinions, how to identify important issues and how to analyse information critically. The influx of new activists after Maidan required a strong media to educate them. But these media are yet to emerge. First of all, at that time, the Ukrainian media were too busy serving the interests of the oligarchs who owned them. Many questions that required a thoughtful approach remain unanswered, and people were left to their own devices in finding the most appealing explanation for pressing questions. For instance, the most common answer to the natural question “why did we lose Donbas to Russia?” involves the abstract and vague category of the Donbas’s “special identity” as the main determining factor in the outcome of the war in Donbas. This approach fails to account for other important factors and even contributes to the creation of that identity (and with it, the further polarisation of society) during wartime. Second, propaganda is often exaggerated as a factor in the “hybrid war”, downplaying the significance of other factors — not only political, but economic and military too. According to this rationale, propaganda, a weapon to frighten and demoralise, becomes more frightening and demoralising than bombs and bullets. Dmitry Kiselyov, the Russian regime’s talking head, is probably the most hated Russian person in Ukraine after Putin himself. For a person deeply trapped within the narrative created by the “hybrid war”, a journalist who makes propaganda is perceived as a valuable asset and one who refuses to do it is a traitor that wastes their skills. In these circumstances, Ukraine’s media have often favoured clarity over reliability. Every event is explained in relation to a particular worldview, and that worldview serves as a tool to define and create an audience for the media. That way, articles often fall into one of two extremes, jokingly referred to as “zrada” and “peremoha” (Ukrainian for “treason” and “victory”) — straightforward pieces of journalism, completely devoid of any half-shades, in which a particular notion is either criticised or lauded. 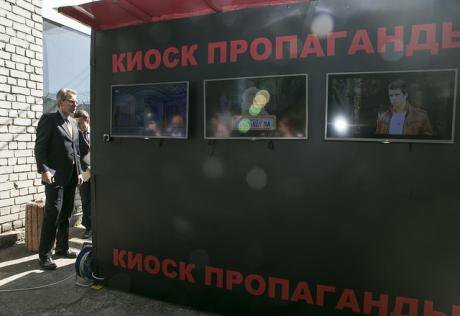 June 2015: "Propaganda kiosk" at Donbas Media Forum. CC BY-ND 2.0 U.S. Embassy Kyiv Ukraine / Flickr. The “zrada” and “peremoha” model thrives on Ukrainian social media, which Ukrainian officials and opinion makers use as an important tool to gauge and influence public opinion. Each major event becomes a part of this black-and-white narrative, temporarily overshadowing every other topic for discussion. It is an emotional roller-coaster: the Myrotvorets leak was a “zrada”, Jamala’s victory at Eurovision was an unmistakable and undeniable “peremoha”; the Panama Papers scandal was “zrada” again (with a heated debate on who committed the “Zrada”, the presidents or the journalists who distorted the facts). Emotional arguments are always more effective, more appealing to this audience — and that works on both sides. The most widely cited account of the Russian propaganda machine, Nothing is True and Everything is Possible by Peter Pomerantsev, is not free of such problems: it is vague on details, stereotyped and excessively melodramatic. Attempting to counter the propaganda and sometimes blatant falsehoods, it is difficult to construct an argument that would be effective as an anti-propaganda measure and critical to details at the same time, as these categories are often mutually exclusive. The very state in which Ukrainian society has found itself since November 2013 — experiencing revolution, annexation and war — has contributed to the public’s apparent mistrust in journalism. Otar Dovzhenko, media expert and lecturer at the Ukrainian Catholic University School of Journalism, compares it to neurosis. However, it isn’t only external factors that undermine the credibility of the media. In the broad range of glaring problems in Ukrainian journalism, such as lack of funding or sub-par fact-checking, Dovzhenko singles out media conflicts — a perfect example being Myrotvorets. “Journalists accusing one another might seem a form of self-regulation to us media people. But these conflicts shouldn’t demonstrate journalists’ inability to adhere to a particular value system.” The audience sees people joining either side of the debate seemingly at random, without any reference to their political views or prior opinions — this only further deepens the public mistrust against journalism. With no one left to believe in Ukraine’s professional media, people turn to other, seemingly “authentic” sources of information, particularly social media accounts run by soldiers, volunteers, local residents. Even Ukrainian media that can’t afford or don’t want to risk sending their correspondents into the war zone might use such unreliable sources. Not only do these sources fail to follow journalistic standards and check the facts: they often present emotional, one-sided accounts, substituting judgements for facts. In a healthy media climate, alternative accounts in social media can ensure diversity. But in the present situation, these alternatives only serve to further polarise audiences and perpetuate the black-and-white narrative. The pressure of propaganda and the problems inside Ukraine’s media community are eroding not just the boundary between adherence to journalistic standards and reliance on unreliable sources, but also definitions of concepts such as "freedom of speech", "right to information" and “sensitive data”. This neurotic state of uncertainty, mistrust and equivocation can easily be exploited by oligarchs and the authorities, as they introduce regulations that could restrict freedom of the press with public approval or at least tacit consent. “Zrada” and “peremoha” are juggled in the realm of abstract, symbolic notions — like those related to memory and history. For instance, on the same day as the Myrotvorets leak was published, Ukraine’s parliament registered a draft bill on the protection of intellectual property. This draft legislation would make hosting providers liable for prosecution unless they shut down a website that received a complaint for hosting pirated content — without any trial or investigation. Some fears have already been expressed that this law might be used to shut down dissenting media instead, as they would be held responsible for the entire content of their websites, including blogs and comments. The real battle against piracy can come at a high price. Savanevsky refers to the 2012 attempt, under the Yanukovych government, to block ex.ua, Ukraine’s biggest file hosting service, and confiscate its servers. Following a sharp backlash, the government relented, and the site has since resumed its operation. Entering into such a confrontation today, the government might easily commit a “zrada” themselves and fall victims to the vicious cycle. Meanwhile, “zrada” and “peremoha” are juggled in the realm of abstract, symbolic notions — like those related to memory and history. The most noticeable provisions of Ukraine’s “decommunisation” laws, which came into effect recently, were related to the renaming of towns, cities, and streets and has become an excellent source of public amusement. One thing that raises concern, however, is the “ban on propaganda of Communist and National-Socialist symbols,” the contravention of which might incur a prison sentence. The public demand for decommunisation — or, rather de-Sovietisation — has been around since the 1990s, so the process is inevitable, argues Yuliya Yurchuk, who researches collective memory at Södertörn University, Sweden. But these laws greatly exaggerate the issue, as they often cite the “communist heritage” as the main reason for the annexation of Crimea or the war in Donbas. Anyone who criticises decommunisation becomes an “enemy”: pro-Russian, pro-Soviet, pro-Communist, pro-annexation and pro-war. Yurchuk also notices the absence of the middle ground: the government’s approach to decommunisation precludes any meaningful discussion. Only two types of opinions are heard — those who fully support the process exactly as it has taken shape now, and those who are absolutely against it. And these laws can carry a real threat too. “When there are laws that can actually lead to imprisonment, and when there is a judicial system in Ukraine that is far from ideal, I would not be too optimistic about the laws simply because no one has been prosecuted under them yet,” concludes Yurchuk. These threats might materialise sooner than expected. Again, there isn’t any real discussion on pro-Soviet versus anti-Soviet issues — they only become labels in the black-and-white narrative of the hybrid war against Russia and “everything Russian”. During the initial outbreak of the Myrotvorets scandal, one of the many internet troll attacks directed against Nastya Stanko castigated her for “supporting” Ruslan Kotsaba, the Ukrainian journalist and blogger who was recently convicted to 3.5 years in prison for obstruction of Ukrainian Army’s war mobilisation effort. Kotsaba’s crime was to publish a video on Youtube where he called for resistance to the draft. The trial was highly controversial, and Stanko merely expressed her disapproval of its “Soviet nature”, quoting a “middle-ground” article by the writer Taras Prokhasko, who argued that Kotsaba was mistaken, but should not be punished for his actions. Kotsaba, himself active participant of nationalist protests during perestroika, can hardly be accused of sympathising with the “communist” legacy. The debate around Kotsaba’s case, however, proceeded in the most aggressive manner possible, with the patriotic majority labelling him (what a surprise!) communist and “pro-Russian”. Effectively, the discourse on any major issue is polarised to the extremes, and moderate opinions are rare. The majority of people who have remained in political activism after Maidan are trapped within this one-dimensional paradigm, instilled by the propaganda frameworks of the hybrid war. In these circumstances, the mass of “moderates” often finds itself powerless against the populist far-right. It is the “moderates” who silently observe clerics and neo-Nazis teaming up to throw stones at the LGBT+ Equality festival in Lviv; these are the people who cheer at hate speech and indulge in stereotypes about people from Donbas; it is they who are eager to imprison dissenters, however biased the trial may be. The authorities are playing along while the cycle of “zrada” and “peremoha” keeps the public distracted. It is a sort of chicken-and-egg situation, in which the government has the power to crack down on opposition as soon as new groups are named as scapegoats — and at the same time, they are expected to act this way. For instance, president Poroshenko finally commented on the scandal nearly a month after it broke out, expressing his disapproval of the leak. However, the president also asserted that the government has no control over Myrotvorets, and urged the journalists present to cease all criticism on this matter. According to Poroshenko, “there are no threats to journalists in Ukraine”. The latest instance of the government's ambivalent attitude is the criminal case against the Lviv Black Sunrise anarchist group, which is accused by Ukraine’s security services of “attempting to overthrow the state” for distributing leaflets ahead of a May Day rally in Lviv. By conflating materials confiscated from Black Sunrise with those from another group, Lviv Antifascist Resistance, the SBU were able to report that they had “foiled a communist provocation in the form of a 1 May rally”. Ganna Grytsenko, a sociologist and anarchist activist who is campaigning on behalf of the accused, is certain that this is merely an imitation of strength by the SBU. “The protests against the prosecution of Lviv anarchists in which I took part were reported by the media, and I don’t see any public approval of the SBU’s actions. Apparently, the public has other, more pressing concerns than indulging in a witch-hunt over this case — and they are obvious,” says Grytsenko. For the past two years, Ganna has observed a rise in patriotism coupled with increased social distance towards Russians; people are also displaying somewhat elevated anxiety levels. “In some instances, this patriotism can be annoying. It might also have a negative effect on freedom of speech. The Myrotvorets scandal shows how the fear of losing an effective wartime instrument can be used to manipulate public opinion,” Grytsenko told us in an interview. 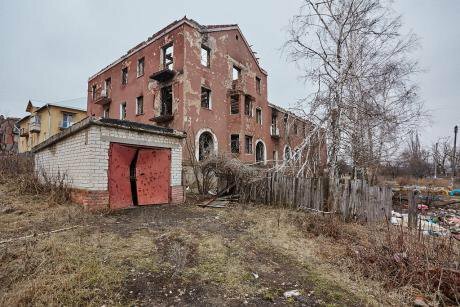 However, she sees this development as the predictable outcome of Russian aggression in eastern Ukraine, adding that “the most effective solution to this problem is now being applied in Avdiivka”. As tensions once again escalate on the frontline, the war in the Donbas is still very far from over. Whilst many more people have become interested in political activism compared to early 2013, the traditional media remain in their pre-Maidan state, stymied by a lack of financing, dependence upon oligarchs and an inability to establish stable value systems. The war and the resulting stress are not the only problems that have to be solved if public polarisation is to decrease. Ukraine’s media has to change as well.